Background: Green Infrastructure (GI) is widely being promoted as an adaptation strategy for urban flooding. Like urban flooding, tree species could be impacted by future climatic conditions. However, there have been limited studies on the implications of future climate on GI planning, mostly due to the lack of climate data at higher spatial resolutions. Objective: In this paper, we analyze the implications of climate projections on heat hardiness zones since this could impact the GI landscape in the coming years. This is an extension of our earlier work on evaluating impacts of climate projections on plant hardiness zones. 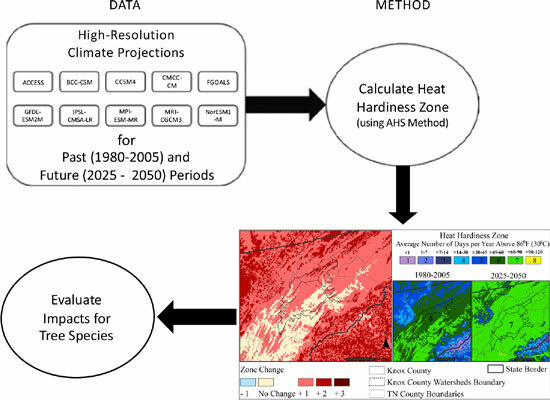 Method: Using downscaled daily temperature data from ten Coupled Model Intercomparison Project Phase 5 (CMIP5) climate models for the historical (1980 - 2005) and projected (2025 - 2050) periods, we analyzed future heat hardiness zones in the watershed bounding Knox County, TN. We analyzed the implications of these outputs for the current list of suggested native and non-native tree species selected for GI in the study area. Results: All the models suggest that a considerable part of the study area will move into the next warmer heat zone. While most trees remain suitable for GI, several are at the limit of their ideal heat zones. Conclusion: The insights from this study will help guide the selection and placement of GI across the study area. Specifically, it should help green infrastructure planners design better mitigation and adaptation strategies to achieve higher returns on investments as more cities are now investing in GI projects. Green infrastructure, climate projection, adaptation, plant hardiness zones, urban planning, urban flooding.